Anne (with an ‘e’ of course) starts out as a mistake. The elderly Matthew and Marilla Cuthbert had planned on adopting a boy to help Matthew with the chores on their Prince Edward Island farm. What are they to do with the red-haired, high-spirited girl who arrives instead? Anne Shirley, with her boundless imagination and heart, slowly brings joy into the narrow lives of those around her, and into the lives of readers who have delighted in her adventures since Lucy Maud Montgomery began writing about her in 1905. Anne’s courage, her enthusiasm, and her ability to love, have made her one of literature’s most beloved characters in Canada and around the world. This beautifully illustrated volume, with a foreword by Kate Butler MacDonald, one of L. M. Montgomery’s grandchildren, is a treasure for those who find in Anne a familiar friend as well as for those who are discovering this “kindred spirit” for the first time. While working as a reporter for the Halifax Daily Echo, she wrote Anne of Green Gables in the evenings over a period of eighteen months and when it was rejected by four publishers she put it away for two years. Then she revised it and a Boston publisher accepted it at once. When it appeared in 1908 the book proved so popular that ever afterwards she felt constrained by the public's constant demand for more stories about Anne. She did write five sequels – as well as many other novels – and they made her rich, but none reached the classic status of the first. In 1911 she married Ewan Macdonald. She had two sons; she enjoyed fame and was made an Officer of the Order of the British Empire in 1935. She died in Toronto in 1942 and was buried in Cavendish Cemetery, not far from her birthplace. There are plenty of people, in Avonlea and out of it, who can attend closely to their neighbors business by dint of neglecting their own; but Mrs. Rachel Lynde was one of those capable creatures who can manage their own concerns and those of other folks into the bargain. She was a notable housewife; her work was always done and well done; she "ran" the Sewing Circle, helped run the Sunday-school, and was the strongest prop of the, Church Aid Society and Foreign Missions Auxiliary. Yet with all this Mrs. Rachel found abundant time to sit for hours at her kitchen window, knitting "cotton warp" quilts--she had, knitted sixteen of them, as Avonlea housekeepers were wont to tell in awed voices-and keeping a sharp eye on the main road that crossed the hollow and wound up the steep red hill beyond. Since Avonlea occupied a little triangular peninsula jutting out into the Gulf of St. Lawrence, with water on two sides of it, anybody who went out of it or into it had to pass over that hill road and so run the unseen gauntlet of Mrs. Rachel's all-seeing eye. She was sitting there one afternoon in early June. The sun was coming in at the window warm and bright; the orchard on the slope below the house was in a bridal flush of pinky-white bloom, hummed over by a myriad of bees. Thomas Lynde-a meek little man whom Avonlea people called "Rachel Lynde's husband"-was sowing his late turnip seed on the hill field beyond the barn; and Matthew Cuthbert ought to have been sowing his on the big red brook field away over by Green Gables. Mrs. Rachel knew that he ought because she had heard him tell Peter Morrison the evening before in William J. Blaire's store over at Carmody that he meant to sow his turnip seed the next afternoon. Peter had asked him, of course, for Matthew Cuthbert had never been known to volunteer information about anything in his whole life. Had it been any other man in Avonlea Mrs. Rachel, deftly putting this and that together, might have given a pretty good guess as to both questions. But Matthew so rarely went from home that it must be something pressing and unusual which was taking him; he was the shyest man alive and hated to have to go among strangers or to any place where he might have to talk. Matthew, dressed up with a white collar and driving in a buggy, was something that didn't happen often. Mrs. Rachel, ponder as she might, could make nothing of it and her afternoo's enjoyment was spoiled. "I'll just step over to Green Gables after tea and find out from Marilla where he's gone and why," the worthy woman finally concluded. "He doesn't generally go to town this time of year and he new visits; if he'd run out of turnip seed he wouldn't dress up and take the buggy to go for more; he wasn't driving fast enough to be going for the doctor. Yet something must have happened since List night to start him off. I'm clean puzzled, that's what, and I won't know a minute's peace of mind or conscience until I know what has taken Matthew Cuthbert out of Avonlea today-"
Accordingly after tea Mrs. Rachel set out; she had not far to go; the big, rambling orchard-embowered house where the Cuthberts lived was a scant quarter of a mile up the road from Lynde's Hollow. To be sure, the long lane made it a good deal further. Matthew Cuthberfs father, as shy and silent as his son after him, had got as far away as he possibly could from his fellow men without actually retreating into the woods when he founded his homestead. 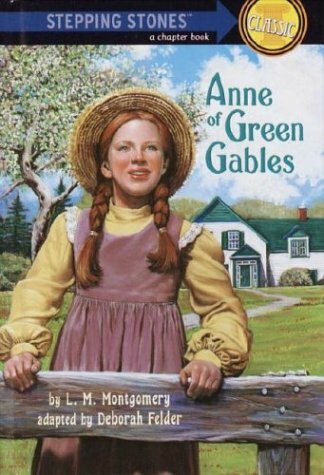 Green Gables was built at the furthest edge of his cleared land and there it was to this day, barely visible from the main road along which all the other Avonlea houses were so sociably situated. Mrs. Rachel Lynde did not call living in such a place living at all. 1. It's just staying, that's what," she said as she stepped along the deep-rutted, grassy lane bordered with wild rose bushes. "Ifs no wonder Matthew and Marilia are both a little odd, living away back here by themselves. Trees aren't much company, though dear knows if they were there'd be enough of them. I'd ruther look at people. To be sure, they seem contented enough; but then, I suppose, they're used to it. A body can get used to anything even to being hanged, as the Irishman said."